Hi everyone, I am having a rough morning! I worked a late shift throughout the night (im still at work right now) and several hours ago (arround 5 AM) I was getting ready to go home but I figured I would water the plant in the other room first (its a poinsettiaÃ¢â‚¬Â¦or was a poinsettia). I have had it for over a year, an old coworker gave it to my family a few weeks before he passed away back in 09. I am good with plants and it was at my house (my parents were caring for it) but they wernt doing too good so last year I brought it to work (the beginning of 2010). It perked right back up and has been doing great. It nearly doubled in size over the past year. It even turned red this past Christmas (naturally- I didnÃ¢â‚¬â„¢t cover it at all, it just got natural light from the outside window). Last week I forgot to water it and it dried up pretty bad, it lost nearly half its leafs. Never the less I watered it good and I finally got it looking decent several days ago because I picked off all the dead leafs and most of the remaining leafs rehydrated from the water. The flowers toward the bottom were the ones that dried up, most of the tips were fine. I knew how fast it grows so I figured in no time (well several months) it would be looking great again after it gets new leafs. So I went upstairs to water it several hours ago and noticed it was gone (it was not in the room it has been in for the past year- by the window). I searched all the offices- I could not locate the plant anywhere. I saw a trash bag near the door and figured I would check it- and I opened the bag up and was shocked what I saw. It was like a homicide scene- it appears the office secretary thought it looked alittle barren due to some leafs falling off (even though it was looking good again) and she decided to take it upon herself to get rid of it. She cut off all the branches so it would fit nicely in the trash bag, and left the trash bag by the door for someone to throw into the dumpster today. I assume she did this before she left work yesterday at around 5 pm because I saw the plant around 4 pm and it was looking just fine (apparently not to her however). I desperately tried to clip the tops of the branches off (at an angle) so I could maybe propagate the tips since they wernt in that bad of shape. Luckily I have potting soil and perlite here at work so I mixed up a batch (50 / 50) and located a container and filled it so I could try to get them into the soil as quick as I could. I cut about 10 tips off (the rest were in too bad of a condition). I put them in the potting mix I made up- but I donÃ¢â‚¬â„¢t know what to do now. I know ideally it would be good to use rooting hormone to optimize there chances, but it was 5 am and no store was open, so I put them in the potting mix with no rooting hormone. Just checking what anyone suggests- I donÃ¢â‚¬â„¢t know if I should go buy some now or not because if I use it I will have to once again disturb the cuttings that I planted, but maybe it would be best for them? So I donÃ¢â‚¬â„¢t know if its worth the risk or not. Since the stem was cut off at around 5 pm (estimated) and not put back into moist soil till around 5 AM, as you can imagine they have definitely seen better days. But they are not completely drooping so maybe there is hope? Not sure- I never did cuttings before. So any suggestions would be deeply appreciated. Did you keep the bottom of the plant with the roots and bare sticks? 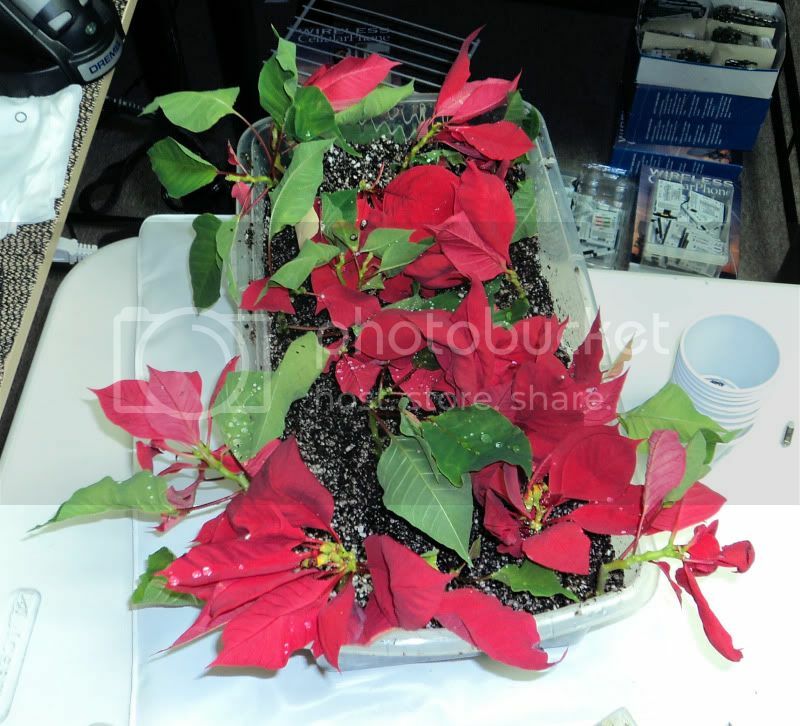 Poinsettias are prone to losing their lower leaves and get gangly. To keep them bushy, the solution is to prune off all the upper growth even to bare sticks some time in late winter/early spring. 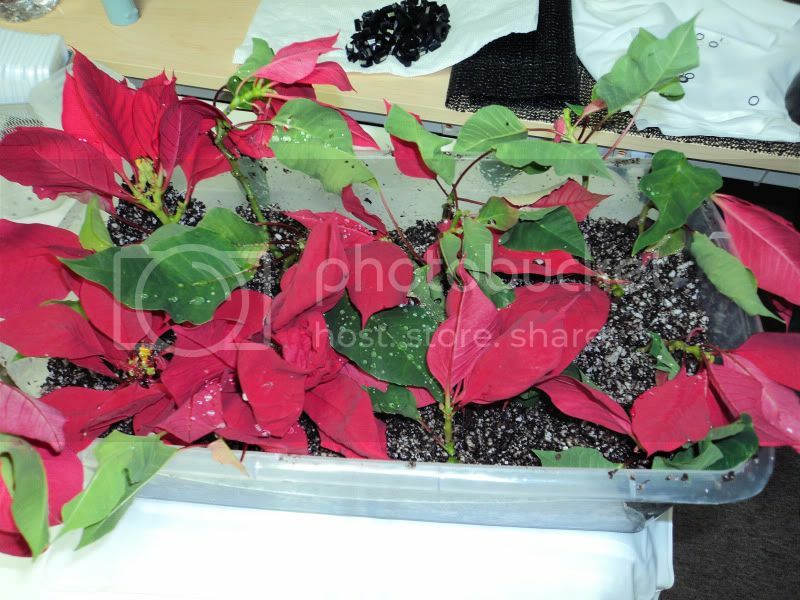 I'm not so sure about rooting the cuttings, but I think you'd have to cut off most if not all of the red bracts since they're part of the poinsettia flowers and flowers sap the strength/energy from the cutting and the large surfaces cause too much moisture loss. Plus the red colored bracts won't make any food for the plant. 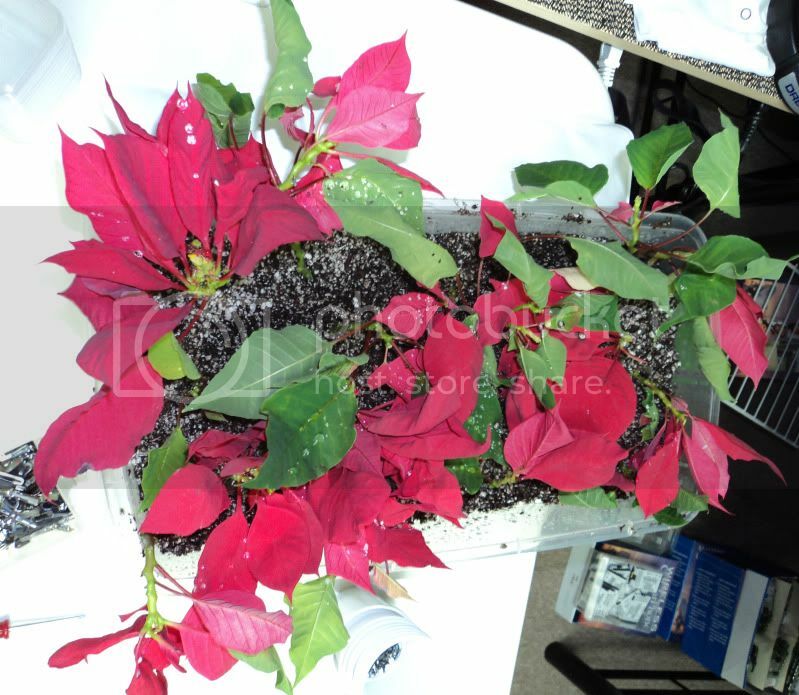 Also, because poinsettias lose sap, it's a bit iffy. I would think you need to let the cut ends dry and callus, but I can't be sure. Rooting hormone powder on the cut ends would be helpful, and definitely a humidity cover. As a quick guide, here's a post in which I talked about rooting cuttings of Rosemary. not the same plant, not even same kind of cuttings, but general principles are similar. I think I talked about rooting broad leaf cuttings elsewhere but I don't have the time to look for it right now. You might want to try Search the Forum. If you don't have rooting hormone handy, soaking the cuttings and watering with chamomile tea or with PLAIN unbuffered aspirin (sometimes you can find them in office first aid kits) dissolved in water (sorry I can't give you the exact amount) helps. Origin for aspirin is willow water (willow bark/sticks soaked water) so if you have access to any willow branches, that can be used too.